In one of his last official functions as Taoiseach, Enda Kenny has joined Prince William, the Duke of Cambridge, at Messines in northern France to commemorate the centenary of the battle there. The battle has symbolic significance as it was the first time that the 36th Ulster and 16th Irish Divisions fought together in World War One. The centenary is also being marked by an exhibition at Collins Barracks in Dublin. The exhibits include one of the 30,000 Triumph H motorbikes made throughout World War One to despatch riders to bring orders from one part of the front to another. This particular example is still in fine working order. On show too are the photos, letters and medals of Lt Col Patrick Hunt. A man from a working class background in Dublin, he joined the army as a private during the Boer War but rose quickly through the ranks. At one stage his medals went missing, but a journalist, Kevin Myers, helped the family locate them. They were recovered by the family at an auction in London. Also on display are items belonging to Fr Willie Doyle, a Jesuit chaplain at Messines. The men regarded him as a brave - but also as a lucky charm because his dug-out was never hit. He survived Messines only to die two months afterwards at the Battle of Passchendaele. The Dublin exhibit includes a stole he wore when saying mass, and parts of his uniform that were cut up and used as relics. 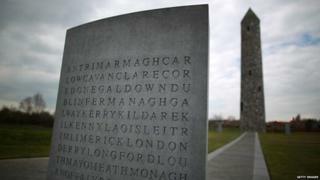 While the battles were ranging in northern France, the events of the previous year, including the 1916 Easter Rising, were beginning to change the Ireland the soldiers had left behind. That is perhaps reflected in what happened after the death at Messines of Willie Redmond, an MP and brother of John Redmond, the leader of the Irish Parliamentary Party. His Westminster seat in Clare was won by Éamon de Valera, one of the leaders of the rising - a sign of things to come in Irish politics. The Dublin exhibition, which is free, is open to the public for at least the next 12 months.